Jonas Folger has claimed the first pole position of the 2016 Moto2 season ahead of the season opener in Qatar. The Dynavolt Intact GP Racing Team decided to expand their Moto2 team this year and the decision to have Jonas Folger as the new addition has proved to be a good one. Folger has been impressive throughout recent testing and FP session 1-3 and his time of 1:59.062 during qualifying has grabbed him pole position for the first race of the year at the Losail International Circuit in Qatar. 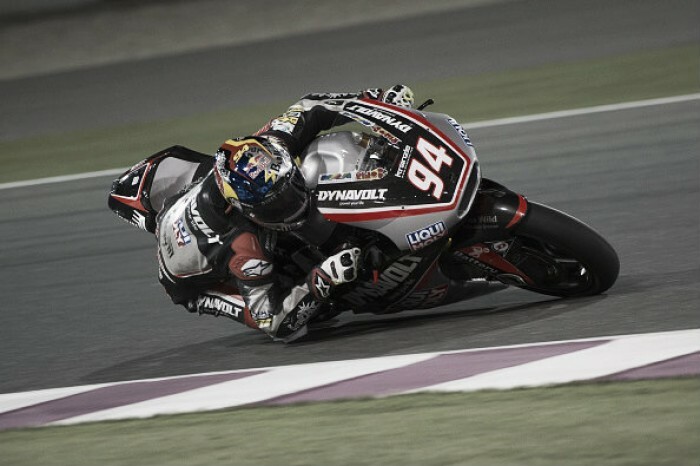 Folger set his fastest time and the fastest ever time around the track on a Moto2 bike after just eight minutes. British rider Sam Lowes has been consistent throughout testing and practice also, however he ended up just 0.072 seconds slower than Folger leaving him second on the grid on his Federal Oil Gresini Moto2 Team Kalex. He felt that his bike was backing into the corners too much for him and returned onto the track for the last 12 minutes to give it everything trying to beat Folger’s time; he set his fastest time after four minutes. Paginas Amarillas HP 40 rider Alex Rins finished fifth after practice and managed to gain third on the grid for the first race. He crashed on turn two with 24 minutes to go as he lost the front sending his bike into the gravel trap; entering this caused the bike to catapult and destroy itself. He walked away unhurt but his bike needed to undergo a lot of work; his team did an epic job to allow him to return to track with five minutes to go, it did however break down before the end of the session. Not long after Rins’ crash, Mattia Pasini crashed in a similar way at turn one from his Iltrans Racing Team Kalex but was able to continue on track as his bike slid instead due to the huge runoff at the first corner. Rins finished ahead of Ajo Motorsport rider Johann Zarco who finished won the 2015 Moto2 Championship and is looking to defend his title. His time however would not have had him going ‘head over heels’ like usual as he was 0.367 seconds slower than leader Folger after he gradually crept his way up the grid with consistent times. He was able to keep on setting his personal best lap but was unable to improve on position. How does the back of the grid look? 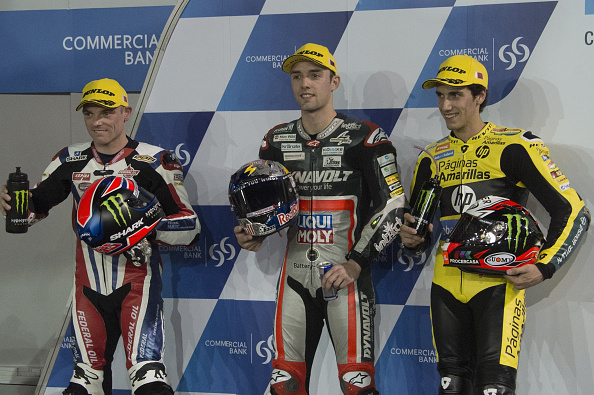 The fastest Estrella Galicia 0,0 Marc VDS rider was Franco Morbidelli who finished fifth ahead of Folger’s teammate Sandro Cortese. His injured teammate Alex Marquez finished in 13th. Thokmas Luthi had looked strong in testing and practice however he lost a lot of time during qualifying as he needed to have a rear shock absorber replaced; he finished tenth on his Garage Plus Interwetten Kalex. New to the Moto2 Championship the Leopard Racing Team will be piloted by the top two finishers from the Moto3 Championship, winner British rider Danny Kent (0.904 seconds off pole) and Miguel Oliveira (1.705 seonds slower). Lorenso Baldassarri crashed his Forward Team Kalex with two minutes to go at the fast turn two which caused a yellow flag meaning riders had to ease up. He lost the back end and was thrown from his bike and had to be carried off in an ambulance. Many riders were able to beat their personal best by the end of the session but not enough to gain significant positions. One second covered the top 14 riders. The fastest Speed Up was Simone Corsi who was 0.967 seconds slower and the fastest Tech 3 rider was Xavi Vierge who was 1.575 seconds slower than the leader. The only Suter in the field ridden by JPMoto Malaysia rider Efren Vazquez who finished last position, 4.552 seconds slower than the leader. Luca Marini and Ratthapa Wilairot tangled at turn 14 after five minutes both walked away however Marini’s bike needed a lot of work in order to return to track. Some riders came close too close to comfort as the Marshalls worked to return his bike to the track so he could return to the pits.